May 31, 2017 – A long-standing question in astrophysics is: how and when did supermassive black holes appear and grow in the early universe? New research using NASA’s Chandra X-ray Observatory and the Sloan Digital Sky Survey (SDSS) suggests that an answer to this question lies with the intermittent way giant black holes may consume material in the first billion years after the Big Bang. The authors’ results argued against the possibility that only a small fraction of galaxies during the first billion years after the Big Bang contain supermassive black holes. 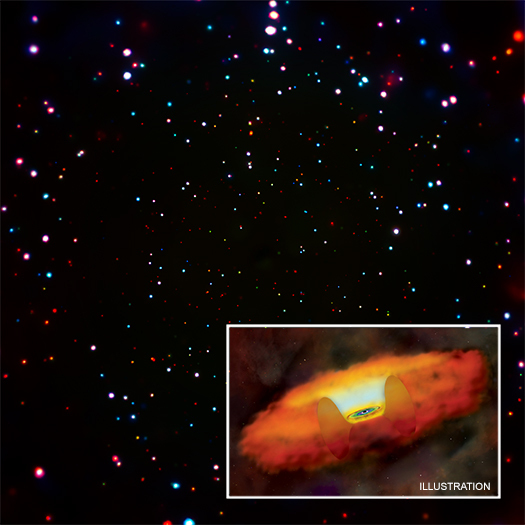 Also, although these early black holes were likely obscured by thick clouds of material, the authors found that most of the X-rays would have been able to penetrate these clouds. The study is based on the idea that when they were born, the first black holes weighed only about a hundred suns. “These “light” black holes seeds could be the remnants of the first generation of massive stars formed only a few hundred million years after the Big Bang” said co-author Maria Orofino, PhD student of the Scuola Normale Superiore in Italy. A paper describing these results recently appeared in the April 2017 issue of the Monthly Notices of the Royal Astronomical Society and is available online. NASA’s Marshall Space Flight Center in Huntsville, Alabama, manages the Chandra program for NASA’s Science Mission Directorate in Washington. The Smithsonian Astrophysical Observatory in Cambridge, Massachusetts, controls Chandra’s science and flight operations.